Isabella seems to be tolerating the feeding tube a little better in the last 24 hours. She is not as raspy and labored as she breathes. Of course, Julianne and I still listen closely and carefully through the night as Isabella sleeps to hear any oddness or disruptions. It makes for some long nights, but there really is no other choice at this point. Isabella has also tried solid foods, although very little, which is the first time since last week that she's tried solids. She had some problems swallowing, but that is expected since she basically didn't have to swallow anything since she got the feeding tube. 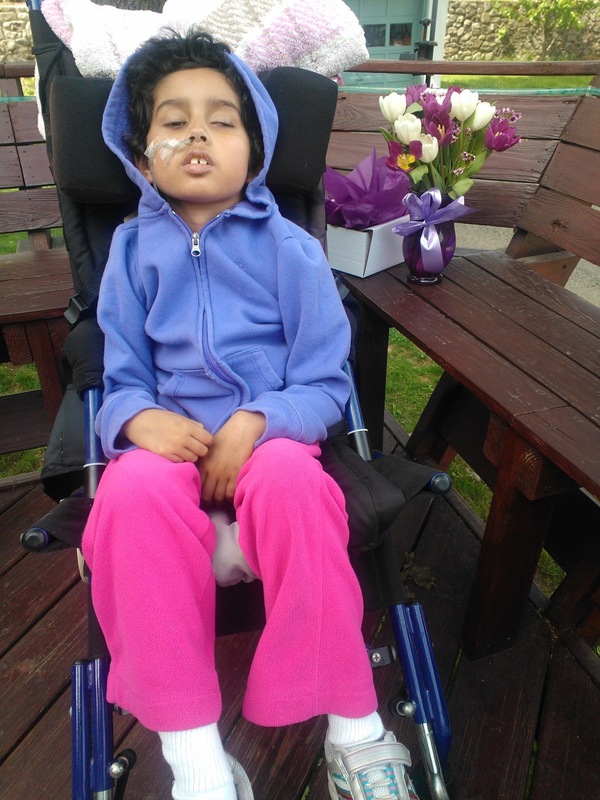 Here is a picture of Isabella sitting out on our deck yesterday, enjoying the warm weather. She had just received the beautiful flowers from her special friend. Finally, here is a music video that a special kid made undergoing cancer treatment in Seattle. It's a little difficult for me to watch since it gives me flashbacks of walking around the pediatric floor at NYU, but maybe it will fill you with some inspiration and additional awareness.